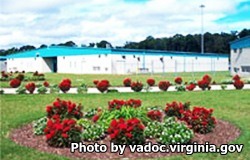 Deerfield Correctional Center is a level 2 facility located in Capron Virginia. It houses approximately 1,080 male inmates. Deerfield Correctional Center consists of seven general population housing units. A, B, and C units contain two pods each. Each pod houses 88 offenders in an open dormitory setting. Building A is reserved for military veterans. D unit houses 57 inmates who are elderly and require assisted living and contains 96 general population beds. E unit contains two pods, one of which houses approximately 100 general population inmates, the other pod houses inmates with diabetes. F unit houses mentally impared offenders, and G unit houses a small number of ofenders who require additional observation or require special assistance. Deerfield does not contain a segregation unit, instead those inmates who would normally be placed in segregation are transferred to other correctional facilities in Virginia. Visitation is conducted on Saturdays and Sundays. The visiting time is rotated weekly, because of this you will need to call the facility to obtain the current rotation schedule.